When decorating and designing a theme for a small home, many of us look to the colour scheme to provide the overall desired aesthetic and ambience. 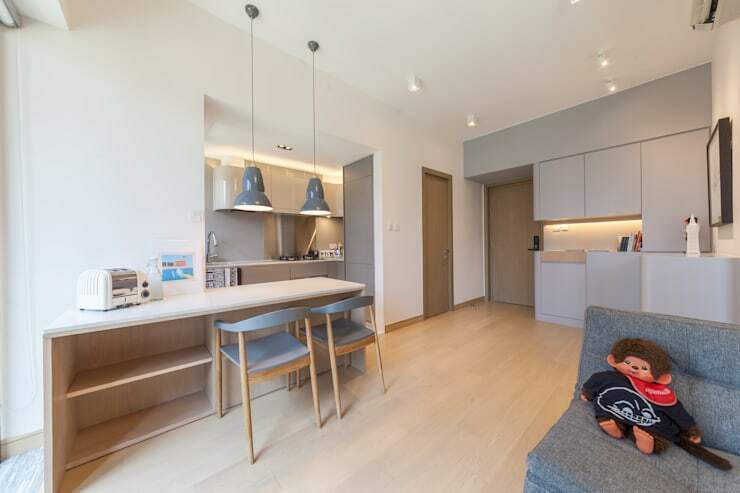 There is no doubt about it; a well-designed home boasts a palette that is both in-keeping with the dwelling, as well as offering a certain mood and aura. But where does one begin, when attempting to choose a colour scheme for a compact abode? Today at homify we’ve removed some of the difficulty by presenting to you our top 6 colour schemes for small homes. Read on below to learn more, and give your property a breath of fresh air, and a new, stylish selection of hues. Neutral hues are a no-brainer when it comes to small or compact homes. Perfect for the amateur DIYer, or home decorator, a neutral theme is almost impossible to get wrong. Not favoured simply for its ease of application, neutral colours also enhance a space by expanding the perceived space. Think about including pastels, creams, and many different shades of white, while opting for contrast in the form of muted tones and shades. The complete opposite of a neutral palette is something vivid and vivacious. Many individuals consider darker hues unsuitable for a smaller dwelling, but in actual fact, they can help increase and expand the area’s apparent legroom. 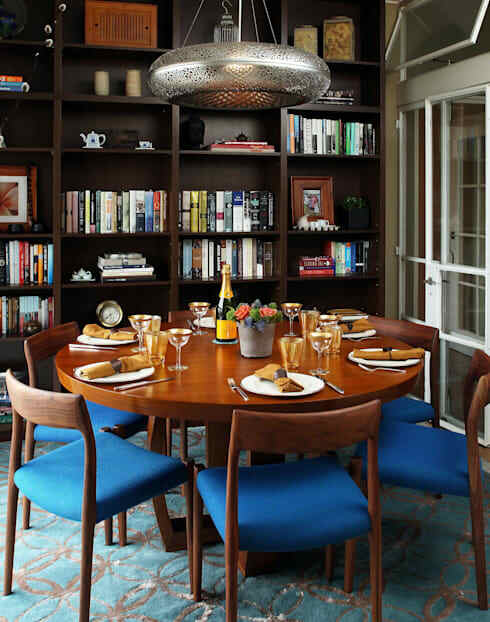 In this example a dark wood bookshelf helps frame the space, while a circular table boasts blue upholstered chairs. Dark and dramatic, this design is eye-catching and alluring. If you like the idea of a colourful interior but want to keep things light, then look for bright hues in the same colour family. The best way to succeed in creating an interior similar to the one above, is to lay a base colour, such as white, then follow up with plenty of accessories, artwork and accoutrements in a colourful shade. 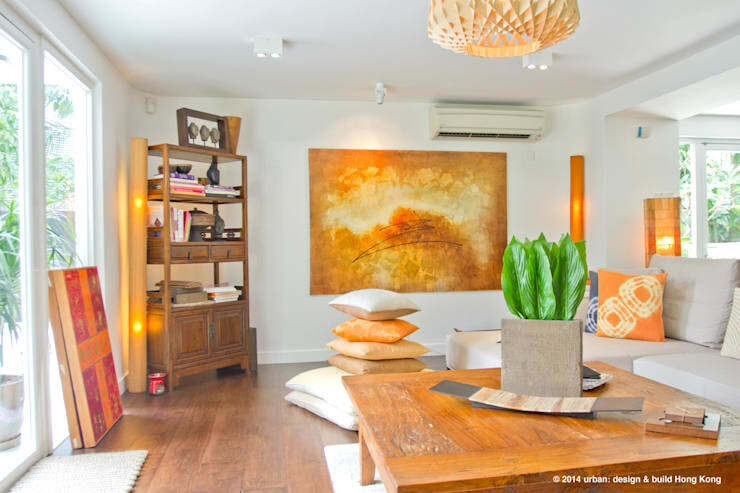 In this room the base is white, the furniture is a medium timber tone, and the accessories are from the orange colour family. Earthy hues are timeless, age-defiant and refined. Not only that, but they offer an interior space warmth, conviviality and a wonderful family-friendly aesthetic. Within a small home, you will want to choose certain items that are earthy in their tone, while keeping others neutral. 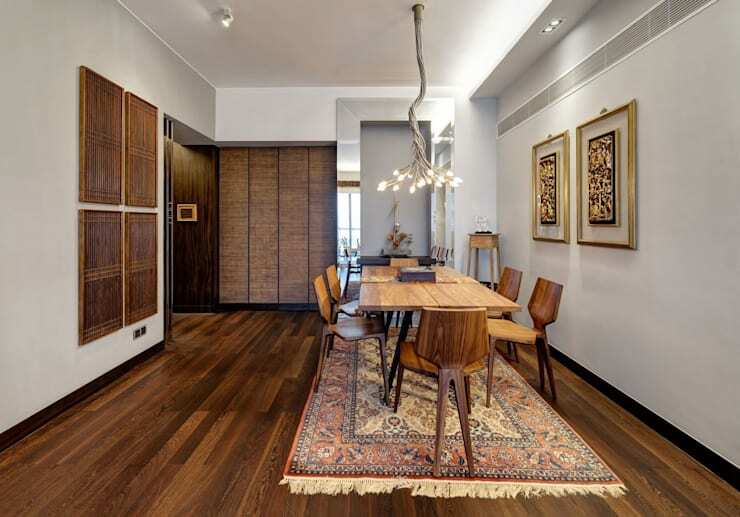 Think cream walls, white ceiling, timber floorboards, and plenty of brown/beige/or terracotta furniture. Classic, striking and undeniably fabulous, all-white interiors are ideal for those homes that lack space. 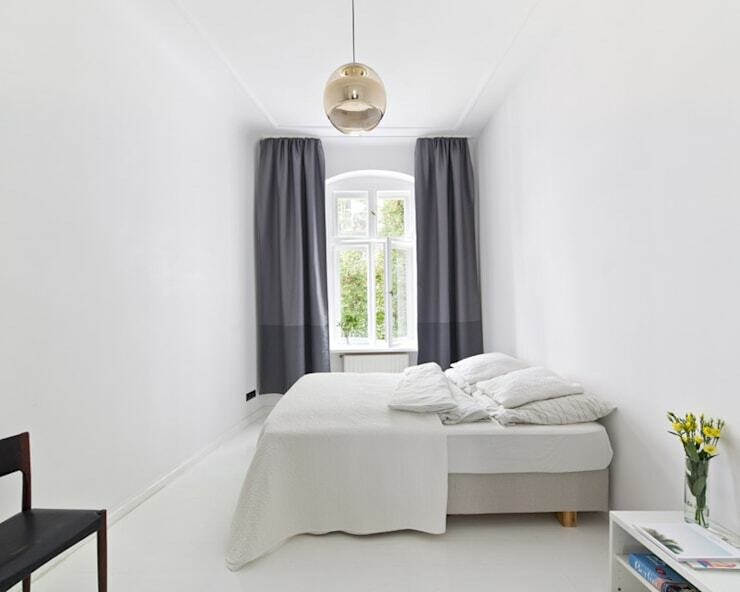 The best thing about all-white interiors is that they lend themselves to a harmonious sense of serenity, and can form a blank canvas for redecorating at a later date. Easy to implement, and wonderful at reflecting light in a room, you should remember to keep your space clean in order to maximise the striking all-white ambience. Similar to the all-white colour scheme, picking a monochromatic palette will help you keep your home’s interior cohesive and well-matched. This can be done by simply choosing one main colour that you like for your space (in this example the hue is grey), and making sure the other elements match. 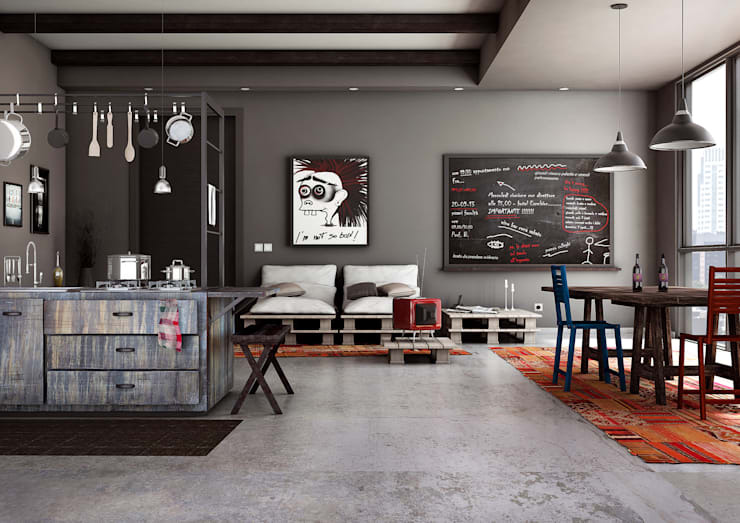 Would you like to learn more about interior design? Check out: 7 steps to a perfectly simple home and continue reading. Which colour scheme is your favourite? Let us know below!